Our company is engaged in manufacturing and exporting of Labtop environment friendly Ultra Plasma Freezer with micro control and CFC free cascade refrigeration system. These laboratory freezers includes controller with digital temperature display, temperature recorder, ON /OFF switch, temperature alarm system with adjustable high / low alarm limits, includes audio visual alarm on temperature deviation. 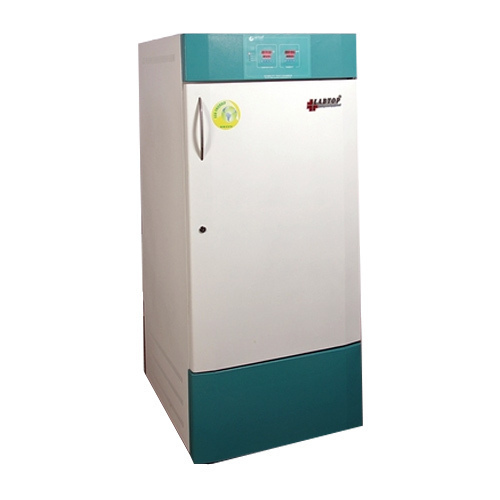 Further, these are specially designed for quick freezing and storing of plasma and related blood components at desired low temperature as low as -80 C.
High density CFC Free Poly Urethane Foam insulated cabinet with corrosion resistant stainless steel interior, white powder coated exterior finish. Keyed door lock for improved security with magnetic door gasket and open stainless steel plasma basket. The cooling is effected by two hermetically sealed Danfoss compressors. Incepted in the year 1996 and Incorporated in the year 2002, we, "Labtop Instruments Pvt. Ltd." are an ISO 9001:2008 Certified Company, counted amongst the renowned manufacturers, exporters and suppliers of a wide range of Laboratory and Blood Bank Equipment. In addition, we also provide efficient after sales service on our range of equipment. These are catering to the requirements of diverse industries such as blood banks, research centers, hospitals, clinical laboratories and pharmaceutical industry. We have been able to comprehend the requirements our clients. Owing to the dimensional precision, durable standards, perfect design and corrosion resistant finish, our product rage is highly demanded all across Indian Subcontinent, Middle East, South East Asia and East Asia.